Don't give up too soon. Perhaps the TFEM Bryant did fight in WWI and survived, who knows? 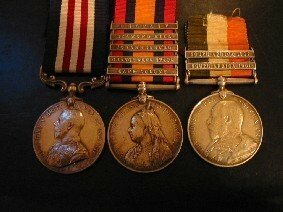 Arthur Rowland served with two of my great great uncles for a numbers of years in India prior to the Great War. They were all signallers with 1st Essex. 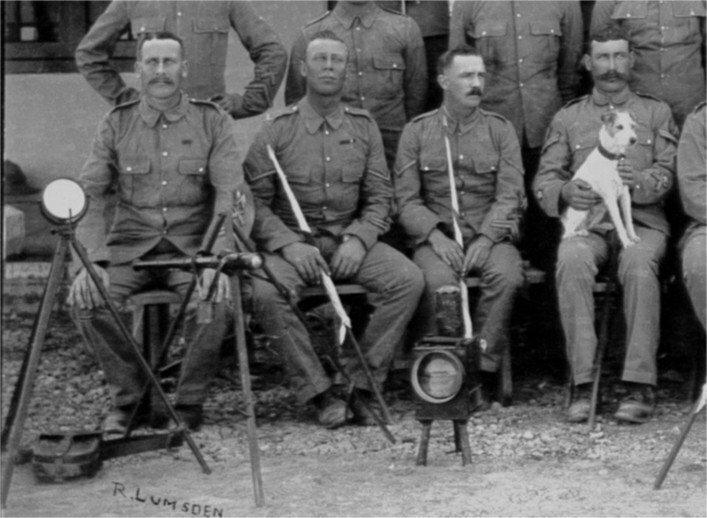 Attached a photo of Rowland as LCpl in 1908 at Ranikhet. Are you able to say how this man may have meet his fate? Additional information: Son of John and Louisa Mary Godfrey, of 51, Warren Rd., Merton, London. Grave/Memorial Reference: Panel 144 to 150 or 229 to 233. I’m afraid not. He’s not mentioned by name in Burrows (surprise, surprise), all I can do is give you some back ground information. The 7th Bn. Essex Regiment landed at Suvla Bay on August 11th, 1915 on “A” beach and “A” beach West and took up positions in a reserve line. On August 14th (in full daylight!) they marched to the front line to relieve the 163rd Brigade. The next days the 7th suffered an amount of casualties, but Burrows doesn’t specify how many soldiers were wounded or were killed in action. On August 27th they went back to the Brigade reserves. Two days later the 7th was transferred to a beach neat a place called Lala Baba. “ When the rations came along next morning there was an issue of bread, to the great delight of the troops. Unluckily, just as the food was being distributed, a shell came over and burst right in a group of men, causing some 43 casualties, of whom eight were killed. It was the most severe day’s loss so far of the campaign and cast a gloom over everyone". So in the end it’s anyone’s guess when exactly Pte. Alfred Godfrey was fatally wounded. Thanks very much for looking up the information about the 7th Essex casualty. The incident on the 30th August must have been awful. Could you possibly look up the events of the 20/21 December 1915, for the 9th Essex. My greatuncle, Pte. Edgar Weavers, was apparently left in line with other machine gunners and bombers to cover the 9th's move out of line when a shell dropped in the trench and the blast caught Edgar and three of his gun team, the question being, where? Burrows (Volume 6 of Essex Units in the War 1914-1918, Service Battalions The Essex Regiments, page 26) is very scarce in giving information about these dates. The 9th was in reserve billets at Quesnoy ( between Mons and Cambrai), but standing to on the 21st & 22nd December 1915. There was damage done to the support lines because of heavy shelling. So this doesn’t seem to be a very clear answer to your question...please see attachment. Looking at the CWGC information I’d guess he was indeed hit when the 9th Essex left the trenches to move to billets. Strange that Burrows doesn’t mention any casualties though. I also noticed that his name was misspelled in ‘Soldiers Died in the Great War 1914 – 1919: Weavers. Thank you for your reply. Since I posted my question, I have recieved the following transcriped letter, sent to Eddie's mother, printed in the Halstead Gazette 2nd Feb 1916. “I am sorry to have to write and tell you of the death of your dear boy Eddie. Our company was relieved from the trenches on the 21st December and all our bombers and machine gunners had to stop back, as our people were expecting an attack by the Germans. The Germans shelled us very heavy, and one of the shells dropped in the trench right against poor Eddie’s gun, so he was killed right out and three more also. He was buried in a quiet little spot just behind our trench, and we are putting up a cross for him. It broke my heart when I heard he was killed, as we had always been such good mates ever since we joined the regiment. We have had a rough time lately, and our regiment has lost heavily. It is hard for a fine young fellow like him to get killed, but our lines out here lately have been awful. I thought it my duty to write and tell you. He was always a very good fellow, and ready to do whatever he was asked. We were both in the same platoon, and the best of mates, and I can tell you how very much I shall miss him”. Thanks again for your help, most appreciated. That's great posting the letter. Thanks! I wonder what the War Diary of the 9th Bn. Essex Regiment reported for those days? I just did a keyword search on "essex regiment". One or two interesting men, e.g. And a coupe of photos of the The Essex Regiment in Norwich Market Place. Hope that's something new for you. Could you please look-up LtCol Barrington Clement Wells, DSO, TD? He was assigned to the 1/4 Essex and was active in Gallipoli and Palestine. In fact, I believe he commanded the battalion in Palestine. He went on to serve with the N. Russia Expeditionary Force and was awarded two Russian Orders. I'd be interested in anything that you could tell me about him but most especially about his Russia experiences. My thanks for this wonderful link! Great photo's of Essex Regiment soldiers and of particular interest to me personally....There is a photo of the 2nd Bn. Essex Regiment in Burrows Volume 2, which was taken of the regiment at Norwich Market Place on August 10th, 1914. It was billeted at the Agricultural Hall. It was on its way to be embarked on the 22nd August, destination: France. The photo’s you mention of Norwich Market Place are, I should think, made by the same photographer and are actually larger partials of the Burrows picture. The one showing the soldiers being relieved of their excess hair is absolutely priceless. Naturally I can’t recognize my Grandfather on the photo’s but it’s the idea....I’m going to order copies of these two photo’s tomorrow! Could you please look-up LtCol Barrington Clement Wells, DSO, TD? 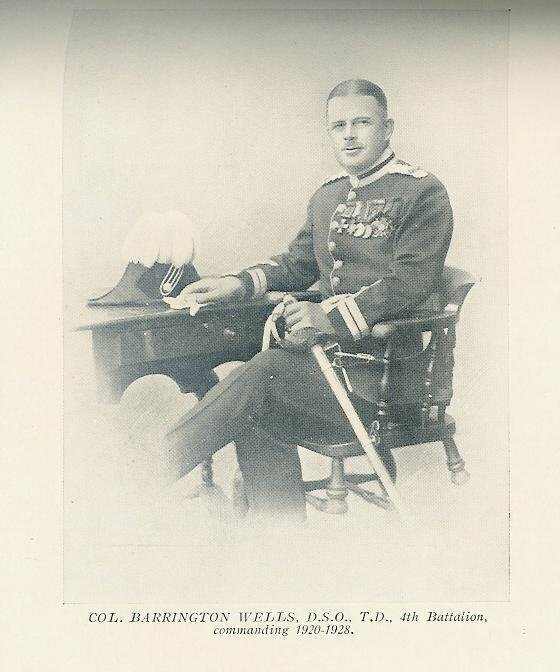 Barrington Wells is first mentioned as Captain of a Company of the 4th Bn. Essex Regiment which formed part of a Service Bn. that was formed by personnel who had volunteered for foreign service. This was in August 1914. The next time he is mentioned is when the 4th Bn. was shipped to Gallipoli. No further mentions for that period, at least not via the Index of Volume 5, The Essex Regiments in the War 1914 – 1919, Burrows. Next entry is for February 1916 when he was in charge of a party at El Rahman, after leaving the Canal Zone. At the end of October 1916 he was a/C.O. 4th Bn. Essex Regiment. On 26-03-1917 he was 2 i/c and on the 3rd November 1917 he was wounded during the attack on Rafah Balah. “I was hit in the arm and another bullet struck my haversack, perforated a tin of cigarettes, a bottle of jam and a Field Service Pocket Book”. (page 157). He was Lt.-Col. C.O. 4th Bn. by then. He was relieved of command on June 27th, 1918 (no reason mentioned) and in a footnote Burrows mentions: “ Colonel Barrington Wells afterwards served in the Russian Campaign and commanded the Slavo-British Legion”( page 292). Would that be the reason he was relieved? The last mention in Burrows states that he was the C.O. 4th Bn. Essex Regiment from June 1920 to 1928. If you send me your email address I can shoot scans of the relevant pages from Burrows in your direction. Thanks! That is allot more info than I had. I'm especially chuffed about the wound info and the Russian info re the Slavo-British Legion. Thanks for the scanned pic as well. I'm sending the e-mail address via PM. Glad those photos hit the spot.. It's amazing what you can stumble across. Additional information: Husband of Louisa Annie Pridgeon, of 62, Park Rd., Colliers Wood, London. Grave/Memorial Reference: Panel 85 to 87. 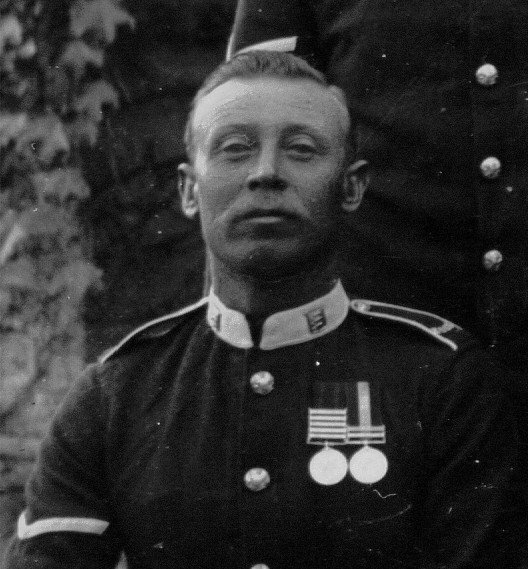 John Pridgeon was born in Kingsland, Hackney in 1881, and married there in 1908 before ending up in Merton, which according to the SDGW is where he was living at the time of his enlistment at Kingston. He appears to have joined the 11th Essex from the outset and was not a later transferee. Does his service number tell us anything? Any info about the whereabouts/actions of the 11th on and around the time of John's death would be appreciated. The 3rd Bn. trained drafts of volunteers for the regular and service overseas Battalions. This could implicate that John Pridgeon was transferred from the 3rd Essex to the 11th Bn. I have analysed the M.I.C. entries for the Essex Regiment with the prefix 3 and this prefix was only used for the 1st, 2nd, 9th, 10th & 11th Battalions. But I’ll admit I’m not well versed in this subject and could very well be talking nonsense here. The battle of Loos: the newly formed XI Corps consisting of the Guards Division and the 21st & 24th Divisions. Part of the Division was the 71st Brigade of which the 11th Essex Regiment as one of the Infantry Battalions .This was their ‘baptism under fire’ The soldiers attacked German trenches and a strongpoint in the Bethune, Noyelles, Vermelles area, along the Lens-La Bassée road. They reached the German trenches under murderous machine gun fire and they suffered very heavy casualties. C.O. of the 11th at the time was” Lieut.-Colonel Radclyffe – leading the Battalion, cane in hand and with a small dog barking at his heels – the second-in-command, Major Davies (both killed) and the Adjutant (Captain Heppell), wounded, all went down within a few minutes before the machine gun fire, which ‘rattled like a mowing machine’. “A” Company was commanded by a Captain Scott. Other members of “A” Company were Sergeant Major Whittaker and Quarter Master Sergeant Boreham. The 11th suffered many casualties: 353 other ranks and 18 officers. The preparations for and the battle itself are described extensively by Burrows. It was a rather controversial event as the soldiers had never experienced battle conditions at the front and were heavily packed, worn out from long marches. Nevertheless, according to Burrows, the author of Volume IV of the Official History of the War was full of praise about the role of the participating Battalions of the 21st and 24th (New Army) Divisions. To give you an impression of the circumstances: “ Thus it was that the XI Corps started at 7 p.m. on September 24th for the final march to the front, the 21st Division to Noeux les Mines and the 24th to Beuvry. Both Divisions were, for the most part, traversing side roads. The slow movement of the troops, unused to active service conditions, upon narrow roads, already congested with much traffic, caused intense fatigue. This, with the rain, lack of sleep and of proper food, ill-fitted them for the strenuous task upon which they were to be employed. ..........A ridiculous incident occurred on the outskirts of Bethune, where a military policeman stopped the 72nd Brigade because the brigade commander had no pass to enter the area”. (Burros, Volume 6, pages 254 & 255). See Map for the actual situation on September 26th. Your thoughts about the 3 prefix seem logical, if I ever find detail to confirm it, I'll let you know. You're welcome Chris and any information on the numbering system is welcome. I forgot to add to the post that if you're interested in the full information from Burrows I can send you the relevant scanned pages. Just contact me directly and add your email address. Do you have any info that might throw some light on this casualty? Additional information: Son of Mr. and Mrs. Edward Steadman, of 53, Phipp's Bridge Rd., Merton Abbey, London. Grave/Memorial Reference: Pier and Face 10 D.
No mention of your man in Burrows I'm afraid. The Somme indeed. The 10th Essex were to attack and take Thiepval. The attack was only partially successful. They were hindered by snipers & heavy machine gun fire. There also seems to have been some confusion about orders to advance after taking 'Schwaben Trench North of Thiepval. They didn't gain all their objectives. Mind, a lot of prisoners were taken and the German soldiers fled owing to tanks being used. Sorry I can't add much more information. I need to buy Volume 6 of Burrows... I understand that it has not been reprinted, and the cheapest edition that I can find costs £85. Does that sound 'reasonable'? I do need it sooner rather than later!